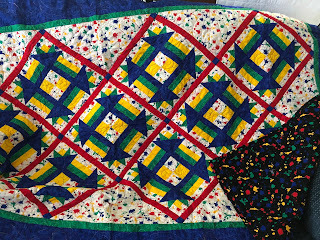 This blog is named for a quilt my boys and I made my husband in 1992. 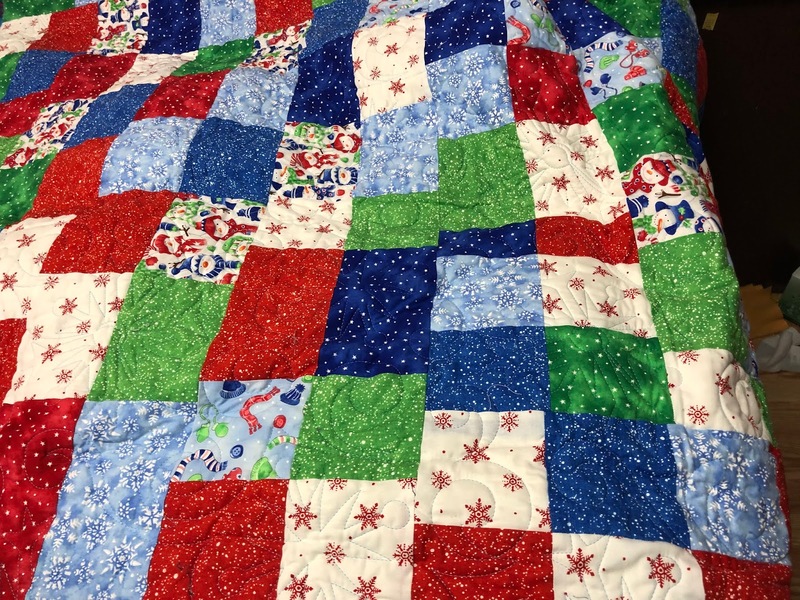 This week I have been busy in my quilting room. 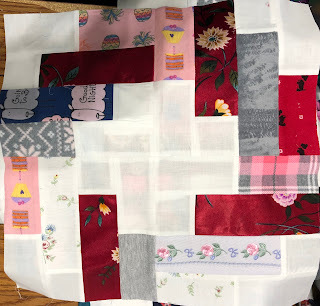 I finished binding one quilt, worked on my Gypsy Wife and started binding the memory quilt, while also working on the second memory quilt. I finished binding Under Cover in Houston early this week and started in on the binding of the memory quilt, which will be revealed next week. Under Cover in Houston is a quilt I started in the 1990s or early 2000s when Debbie Caffery was still living in Alaska. 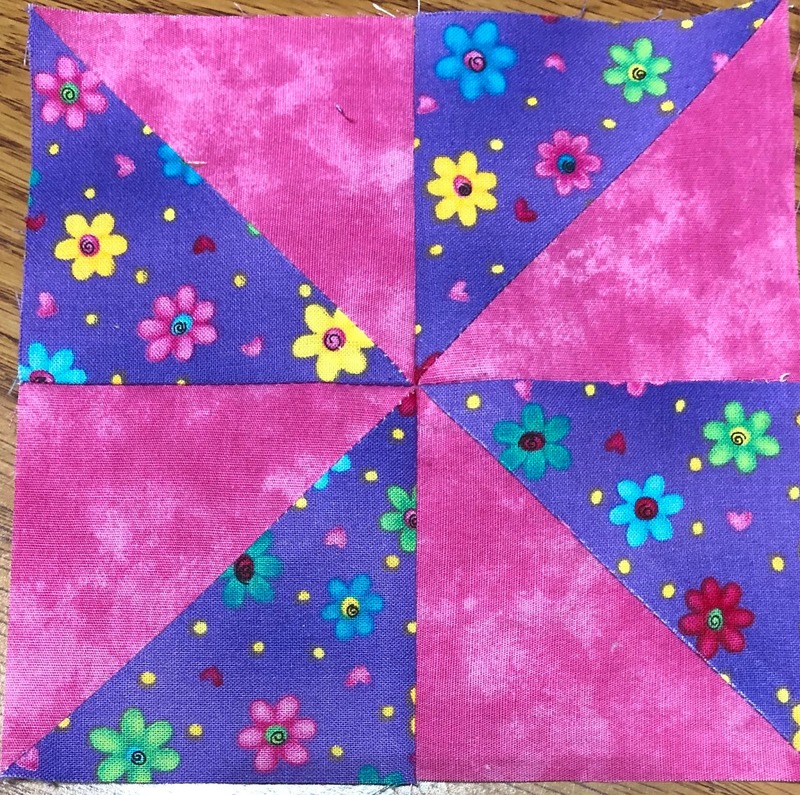 She designed the pattern and taught the class. 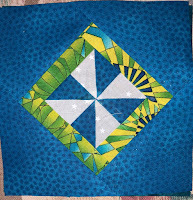 I love her patterns and she is a wonderful instructor. I took it as mystery class. 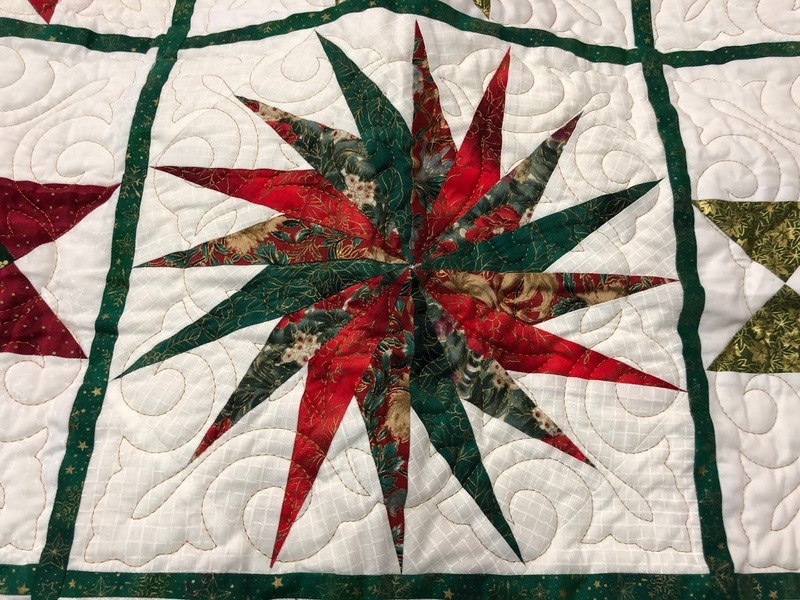 For those that are unfamiliar with quilt mysteries, you know what fabrics and how much, but not the pattern design, just the name. In this case, we needed a light, a dark and a couple of medium prints if I recall correctly with set amounts of each. 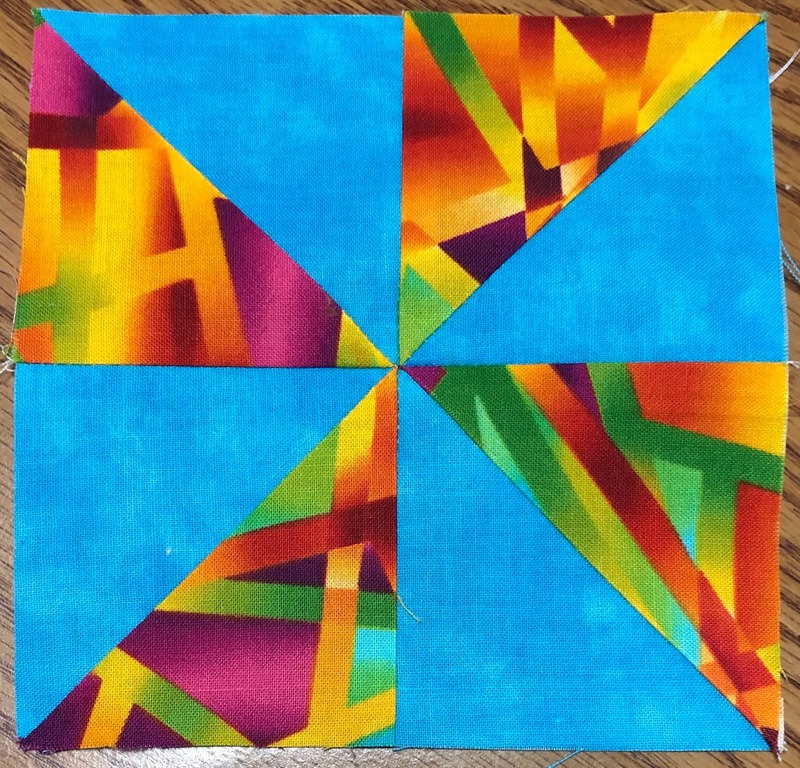 Prior to the class, you are given cutting directions and sometimes some pre piecing directions as well. 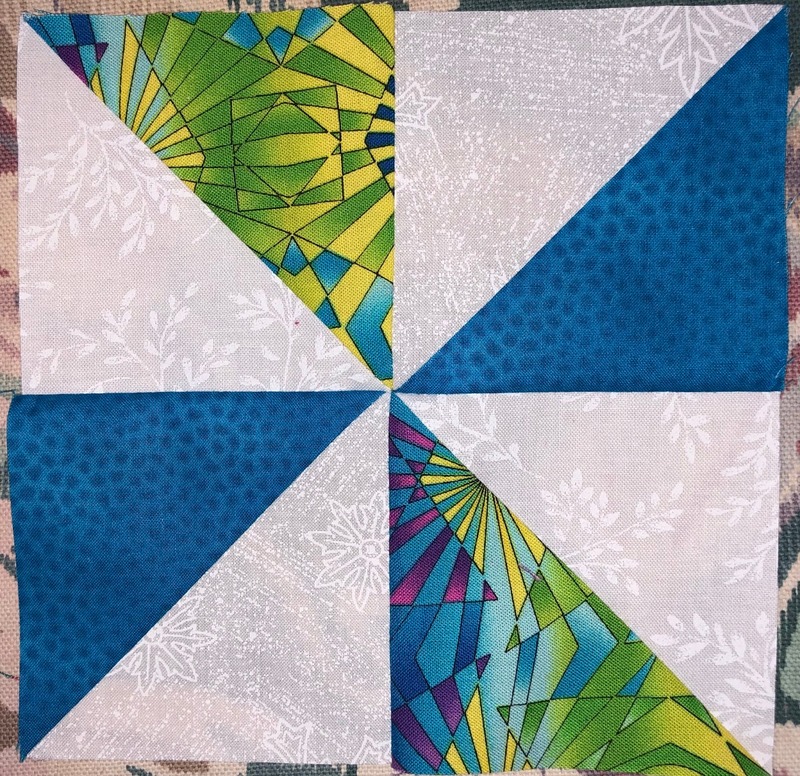 You show up to class with your fabric cut and any pre-piecing completed and are given the first step or if there was pre-piecing the second step and you go to work stitching away. As you finish each step you are given the next step and this continues until near the end of class or until someone is near the point of finishing. Then there is the big reveal. 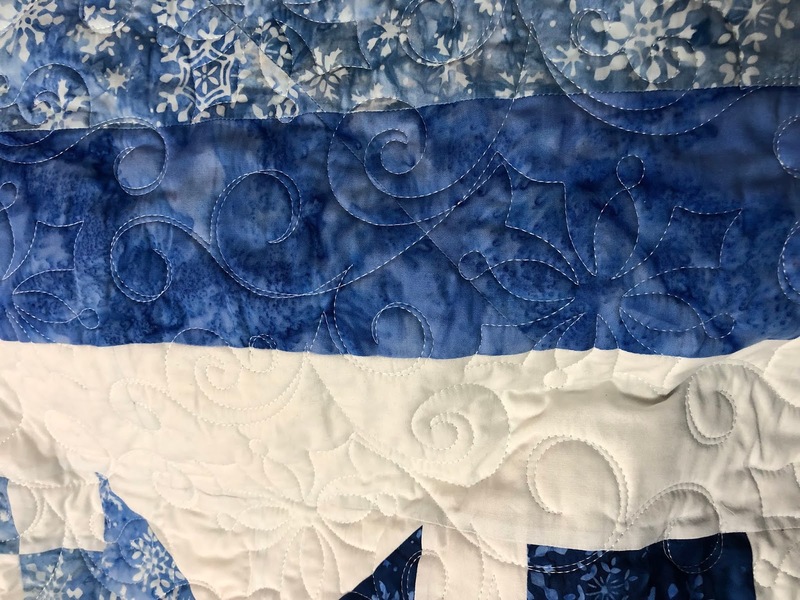 The instructor then brings out their finished quilt to show you. 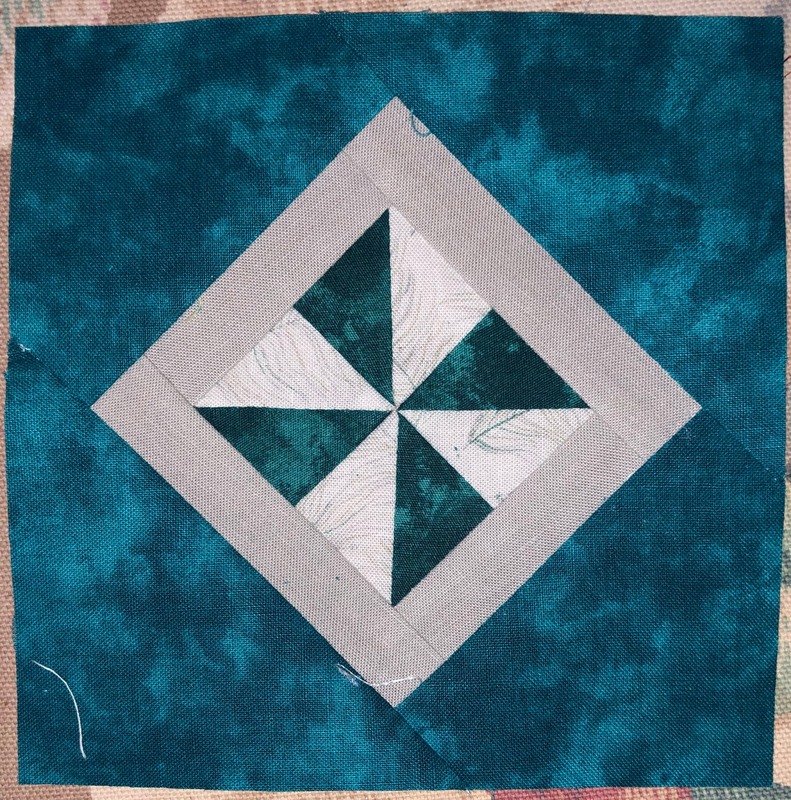 Every quilt is different since no one knows what the quilt will look like. 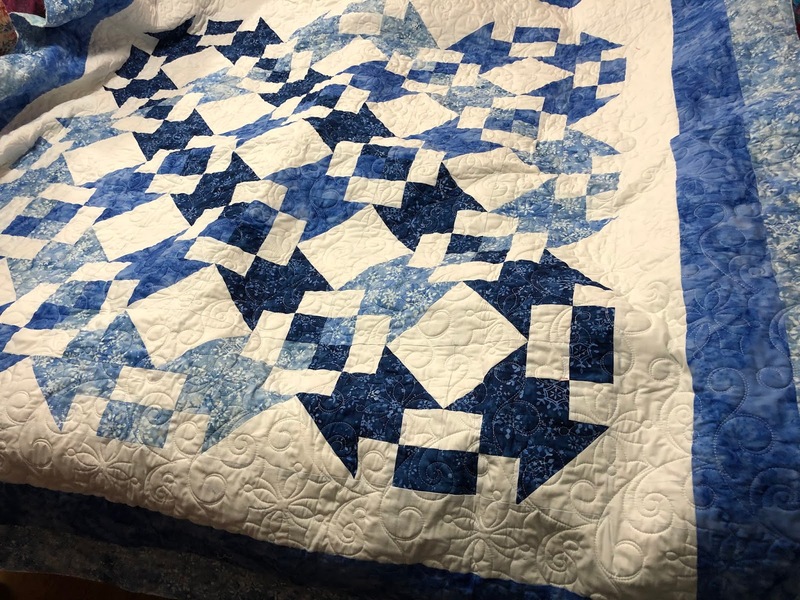 My quilt is different even than the designer’s as I decided to set mine on point, rather than in rows. I picked my fabrics to go with my background fabric as I wanted it to be fun. 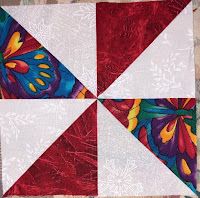 One of the things I always like about mysteries is that no one could copy the instructors color way. 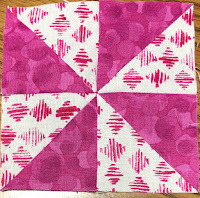 Too often in quilt classes, there are multiple people who copy the instructor's colorway and all the quilts look the same or very similar. 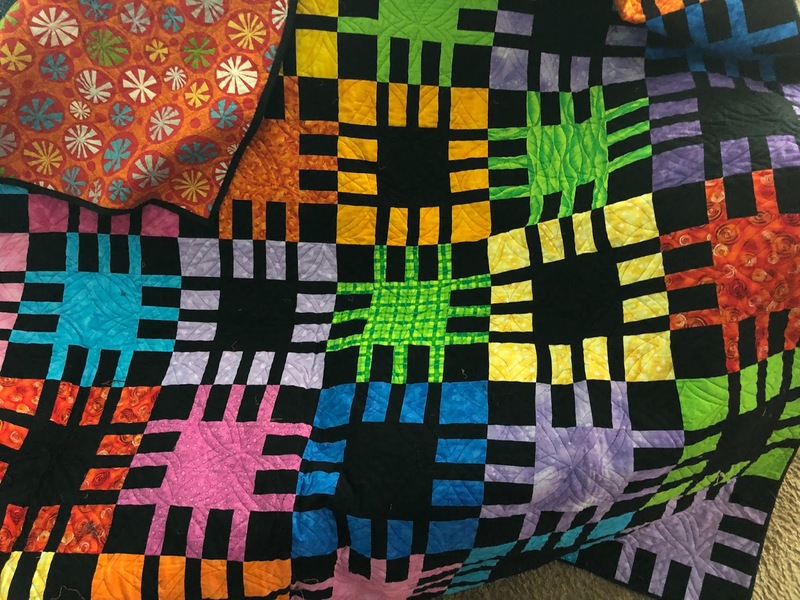 There was only one time I came close to that and it was because the colors were the colors of the person I was making the quilt for. 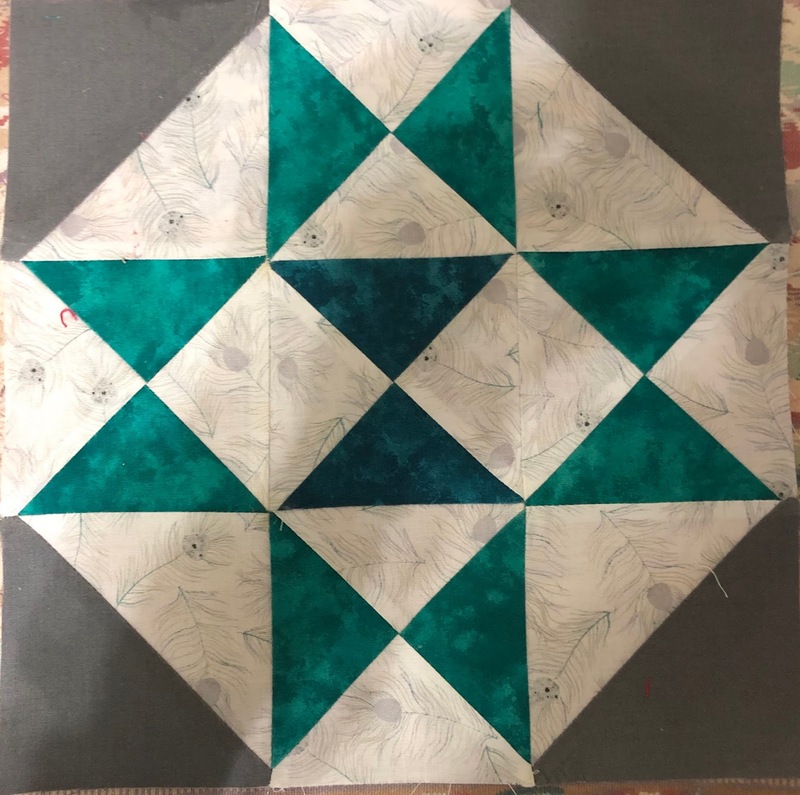 I attached the binding to the front of the memory quilt and have been working on hand stitching it down off and on this week. 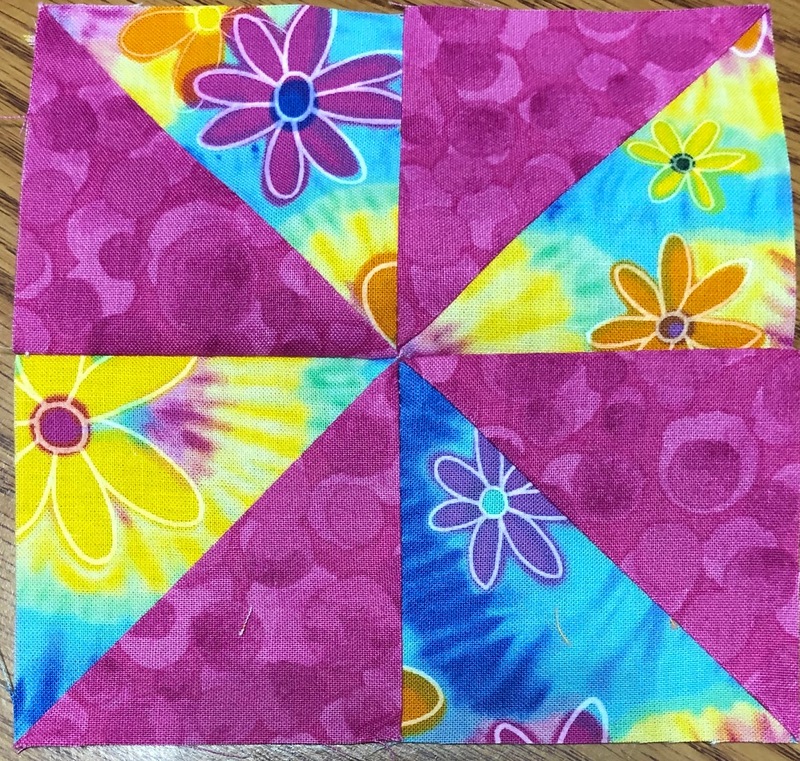 I have about one and a half sides done. The label is on and I hope to have it finished before I head down to Los Angeles for my cruise on the 22nd. 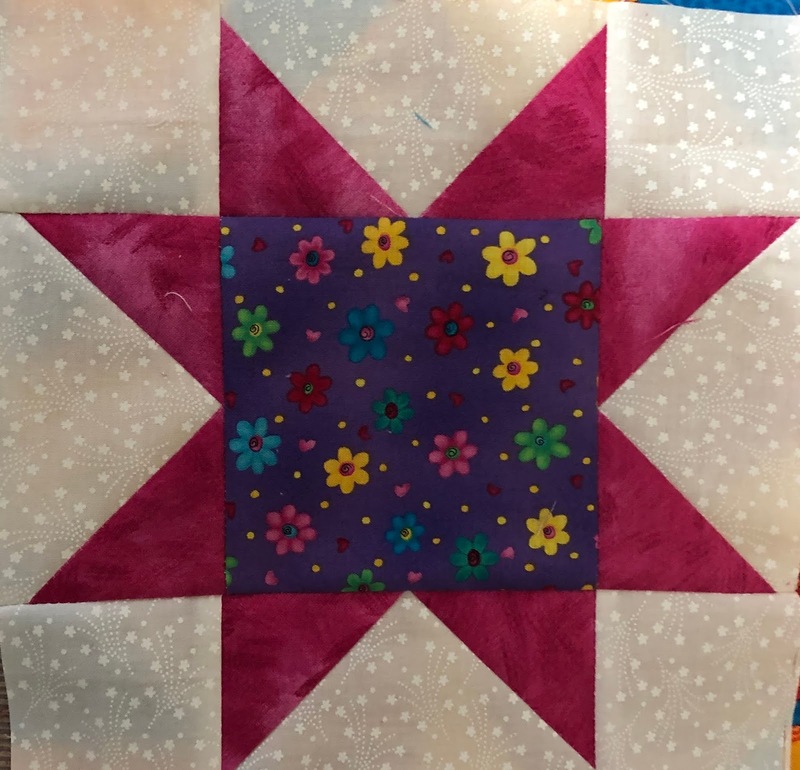 I have been working on the second memory quilt, which is for her sister. I am doing it in a variation of a log cabin. 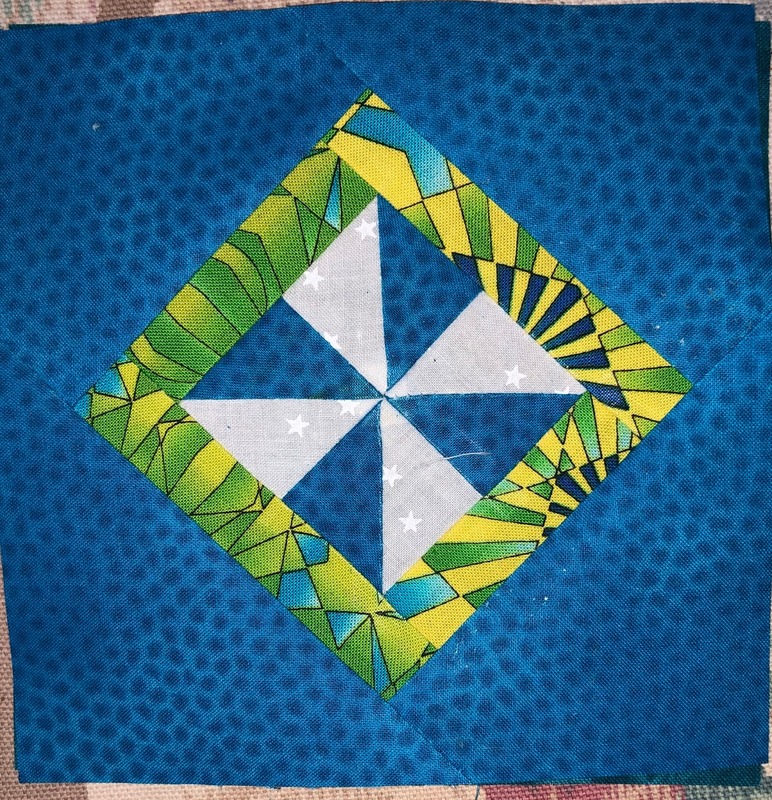 I started with a center block and have been adding logs around the outside. 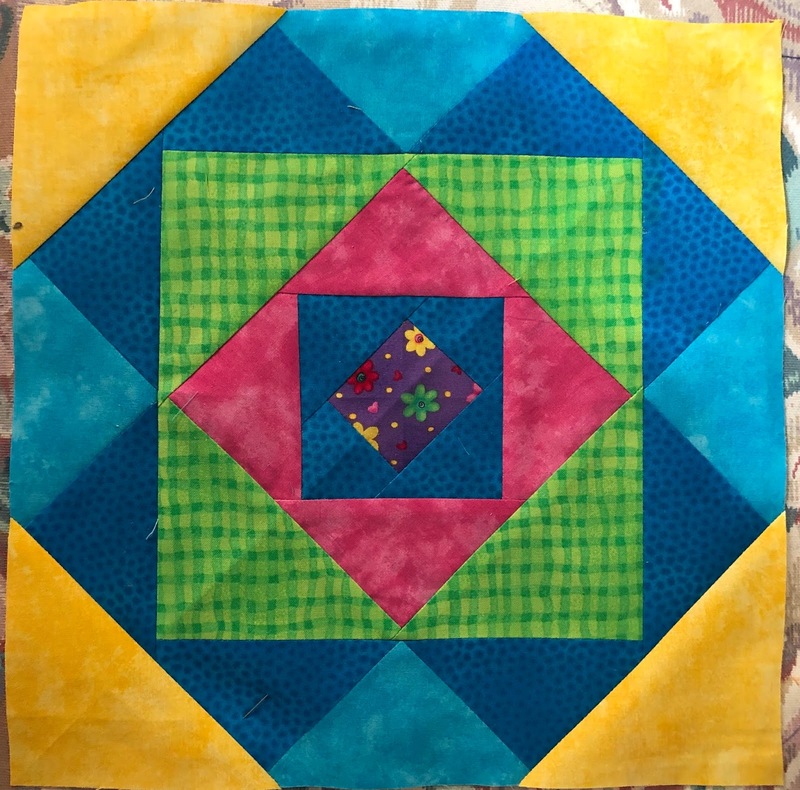 I have several more to add before I will be done, though it will be a smaller, lap size quilt. 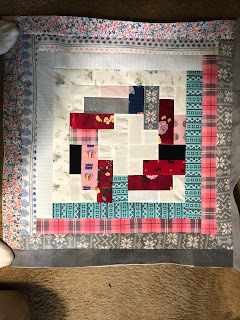 I have to interface almost all the pajama fabric as it is knit and then piece the logs to the centers, so it takes more time than just cutting and piecing. 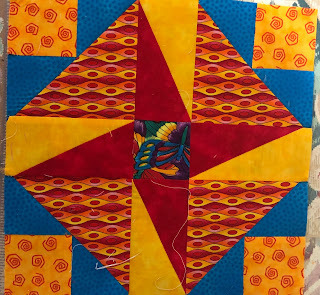 I am not sure if I will finish it before I head out in a week. Please forgive the toes, but with all the interfacing because these are knit fabrics it keeps curling up on the edges. 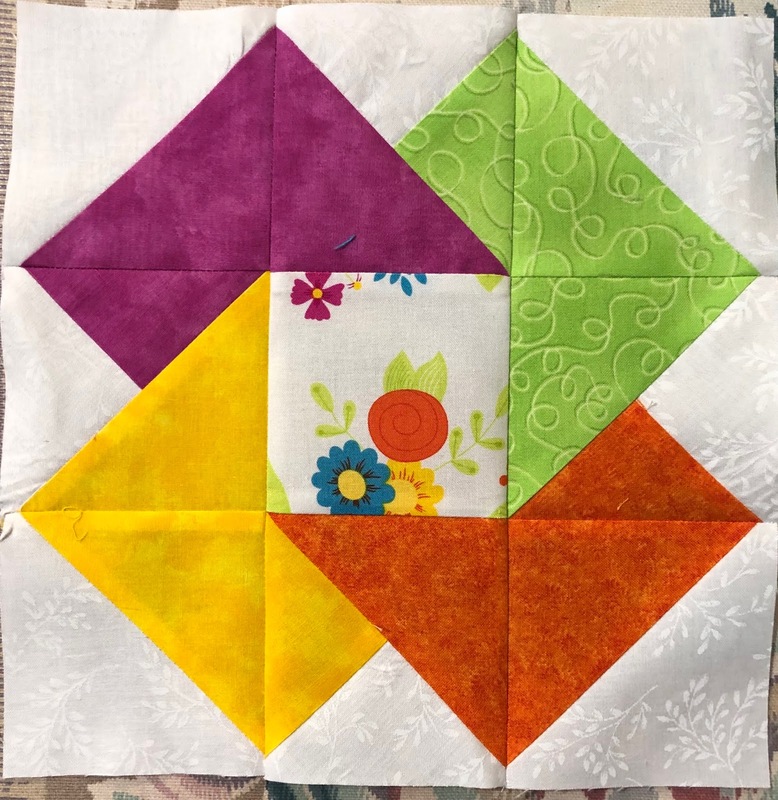 Today I wanted to relax so I pulled out my Gypsy Wife blocks that I had previously cut out and also cut out a few others to go along with them. 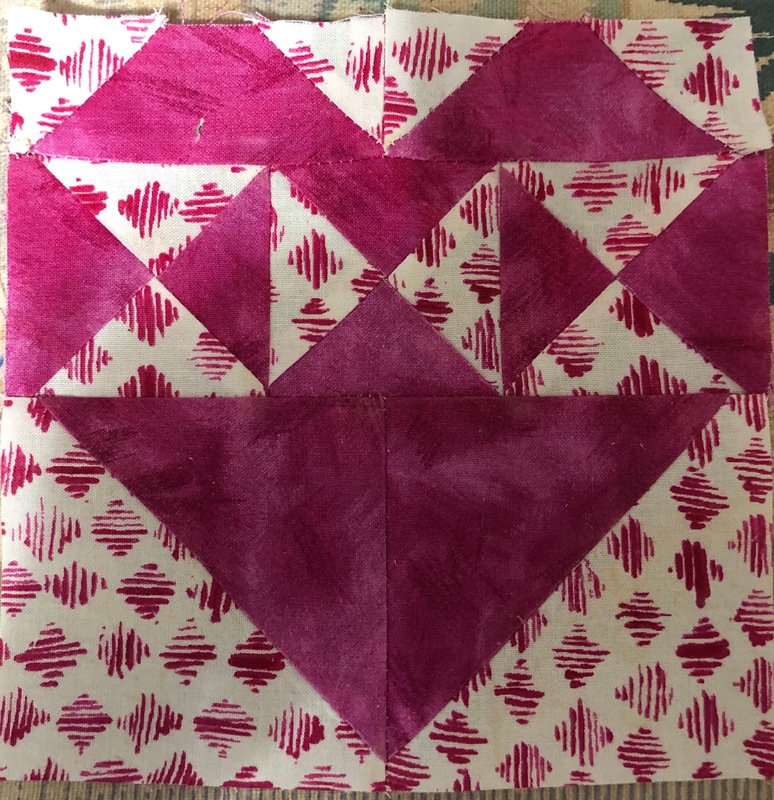 Over this last week, I pieced the From the Heart block, two Crazy Anne blocks, the star block, and a couple of other blocks I am adding to the quilt as I am enlarging it to fit my bed. 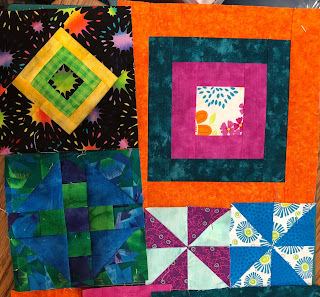 I believe I have most all the blocks pieced for the quilt, except for the filler blocks, though I may add a few more blocks to enlarge the quilt once I start playing with the layout and piecing the sections together. I also have pictures of the infinity scarves I made last week. This is a gift for my friend to keep her warm when we are at the glaciers. I apologize for being late getting this out. Life got in the way and I forgot to transfer my pictures until now, so I could post. This week I subbed four days so did not get as much done as I would have liked, but I did make progress. I completed one quilt, almost finished binding another, and got the binding attached to the front of the memory quilt as well as the label. 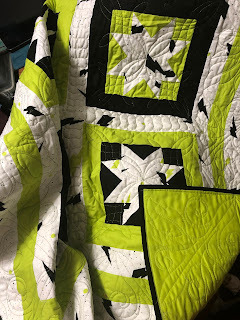 I finished the binding on my July Mystery. 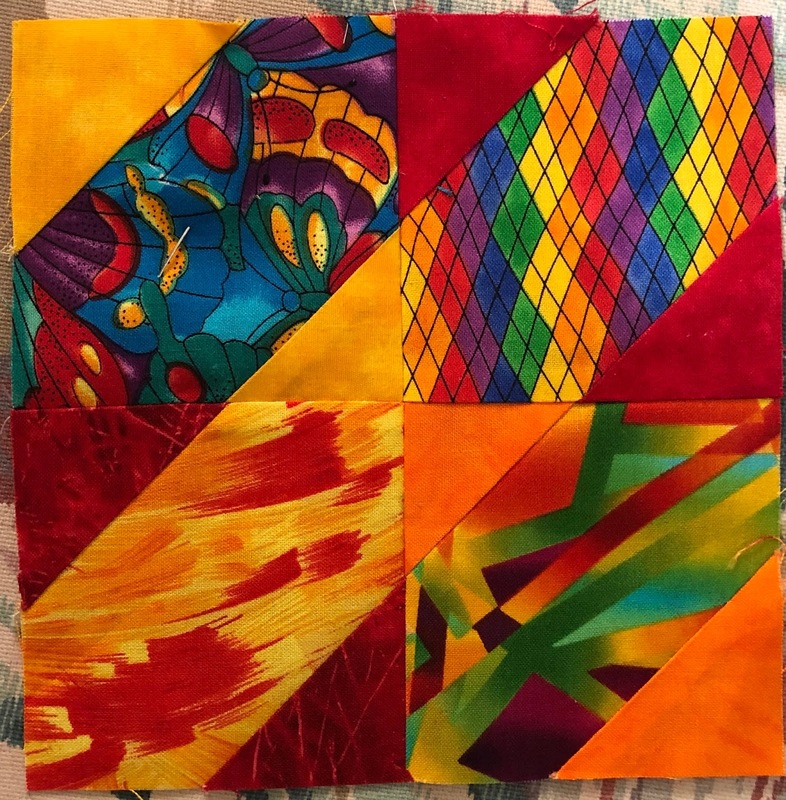 This quilt is one I designed and shared as a mystery with a group of friends last summer. 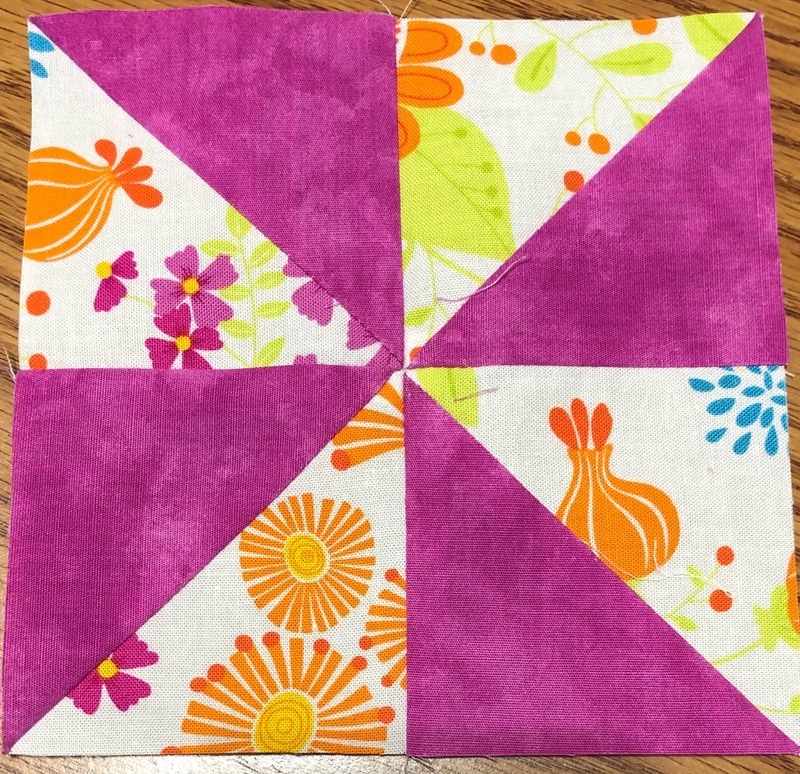 I also have a mini quilt or table topper that I shared from the scraps. 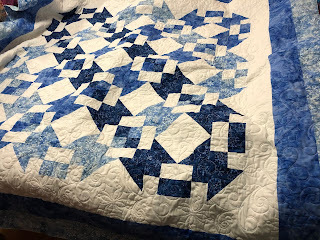 I still need to border and quilt it. 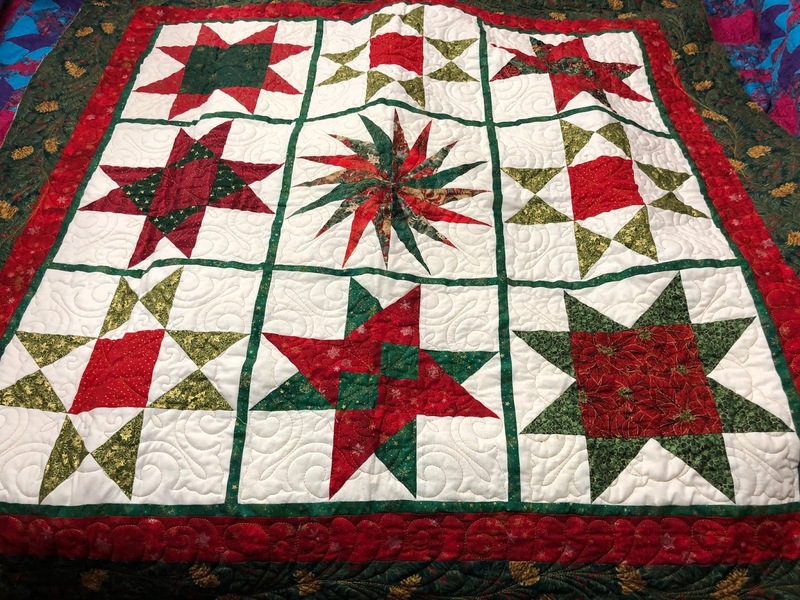 This quilt was quilted by my wonderful quilter Shirley Jackson. I also finished the two infinity scarves I started last week. 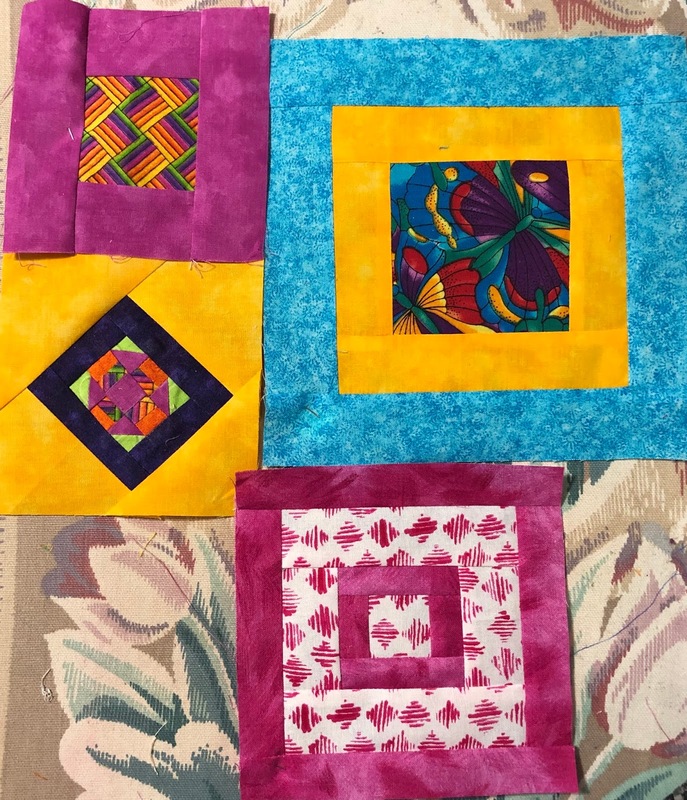 My goal for next week is to finish the binding on Under Cover in Houston and work on binding the memory quilt and my Gypsy Wife quilt. March was a slow month for me quilting wise as I was gone for a week and subbed about three full weeks so my quilting time was minimal. I did make some progress though. I completed the memory quilt top for my friend Theresa and sent it off to the quilter. 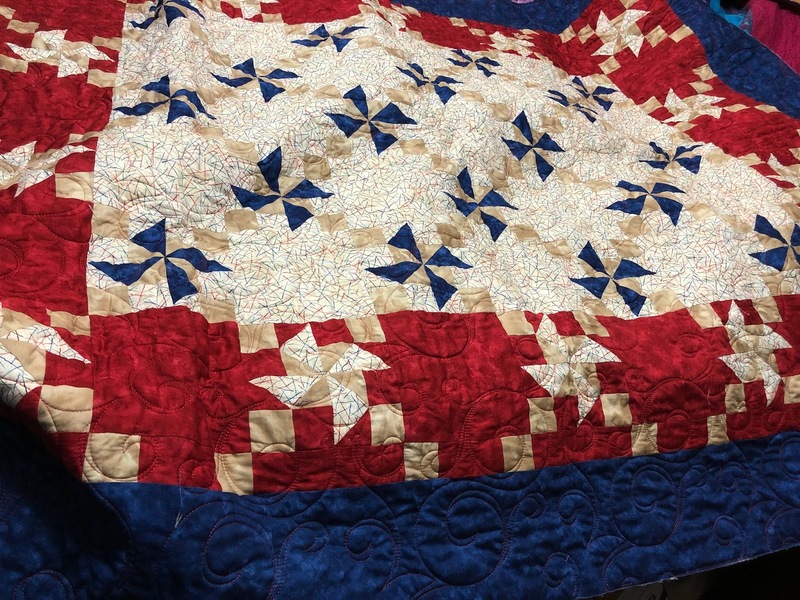 It returned and trimmed it and cut the binding. No pictures until I deliver it later this month. 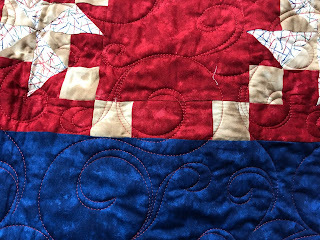 I worked on binding Under Cover in Houston, an old Debbie Caffery Mystery, that is not quite done but will be done this month. 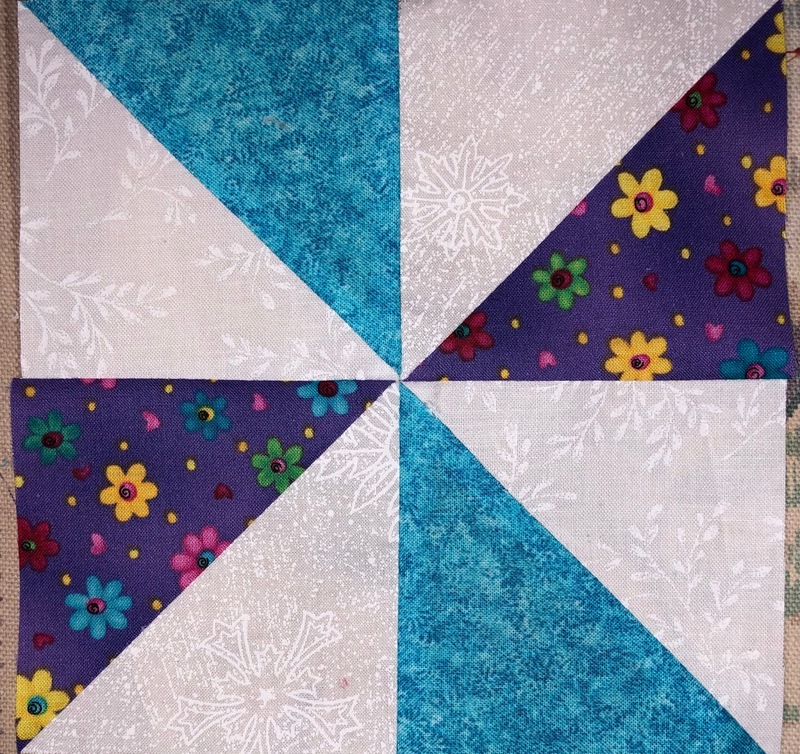 I also trimmed eight other quilts and cut binding for five of them. I bound "No Such Thing as Too Much Fabric" and added a hanging sleeve to it. 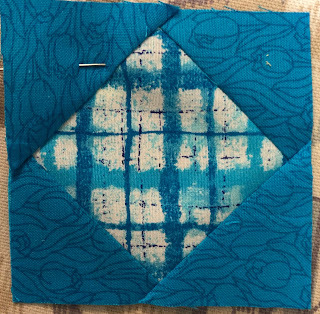 I also pieced and pressed the binding for another quilt and started to attach the binding to it. 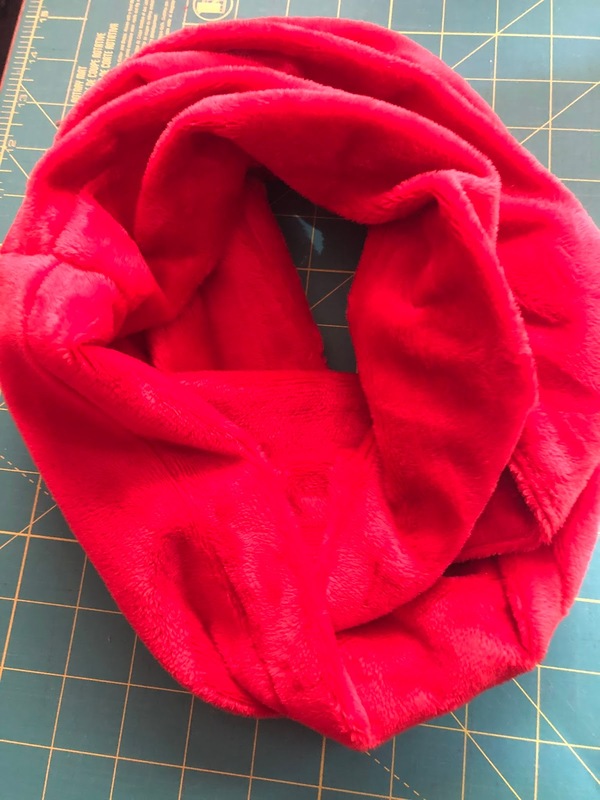 I made two infinity scarves using the leftover minke backing from trimming one quilt. 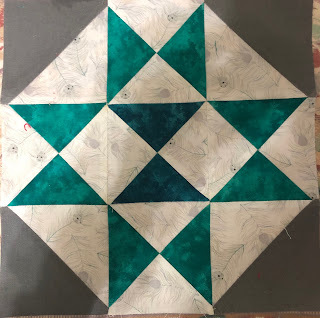 I have to pick the binding for the four other quilts that I trimmed and get to work on binding them as well as the rest of those I trimmed. Since I only completed on binding in March I have to complete three in April to stay on track as my goal is to get two bound a month so I can move the ones I have waiting into Donesville. This week was very productive overall. 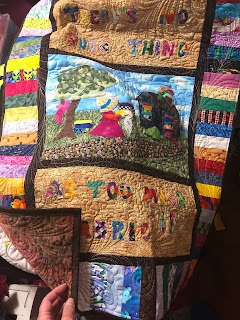 I did a ton of work on the house with regard to decluttering and getting stuff organized for our trip over spring break. 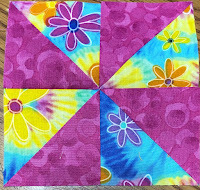 I also pieced several blocks for my Gypsy Wife quilt. 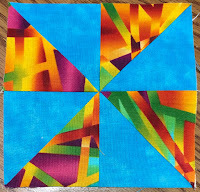 This is my second ColorWheel block. 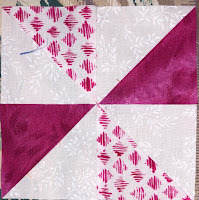 I really like this block so decided to incorporate a second one into my Gypsy Wife quilt. 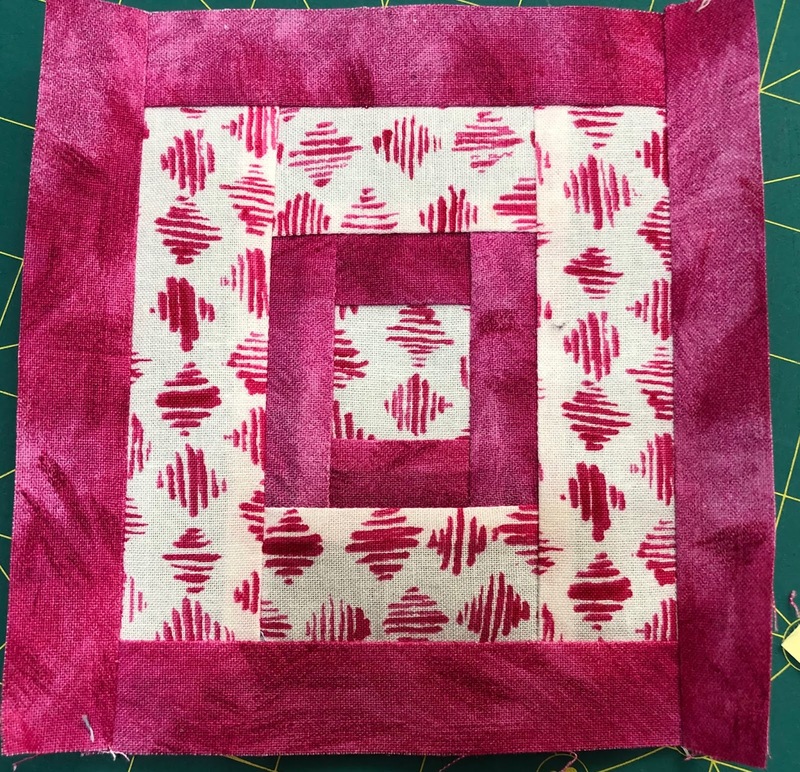 This is my hatchet block. 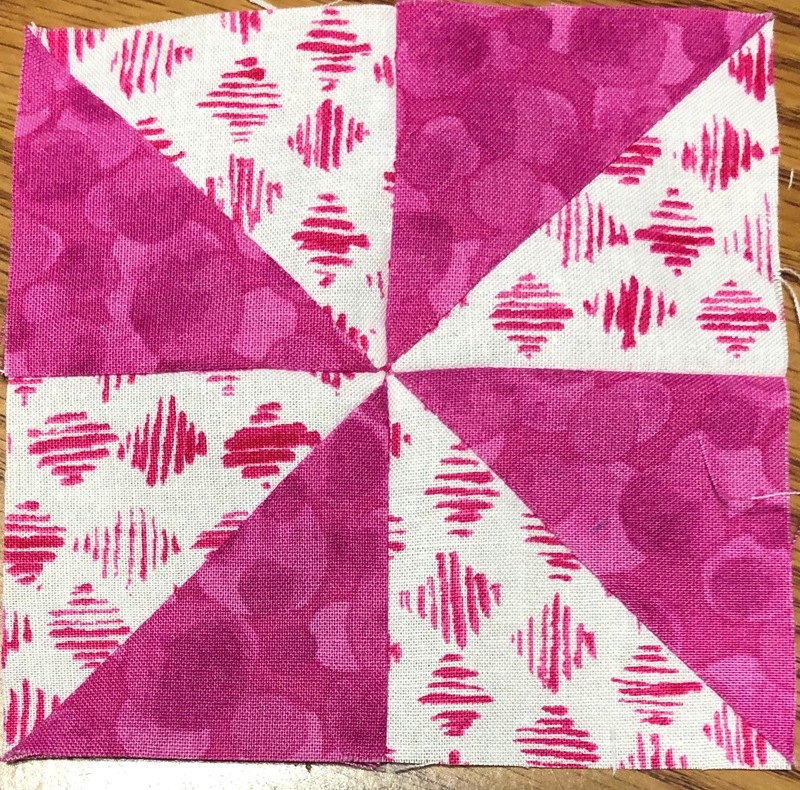 This is the Pershing block and it is a little oversized, but I think I can make it work. 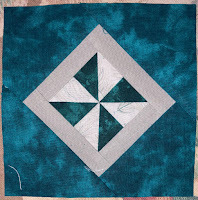 If not I can always make a second one and still incorporate this one into the quilt, even if it is on the back. 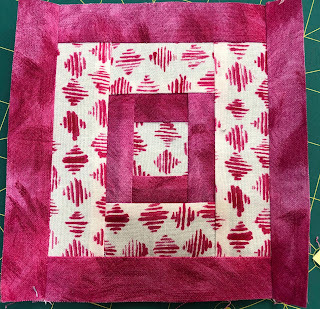 There are several square-in-a-square blocks in the Gypsy Wife and this is just one of many I will be making. 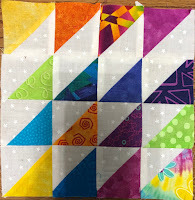 I also completed two triangle blocks. 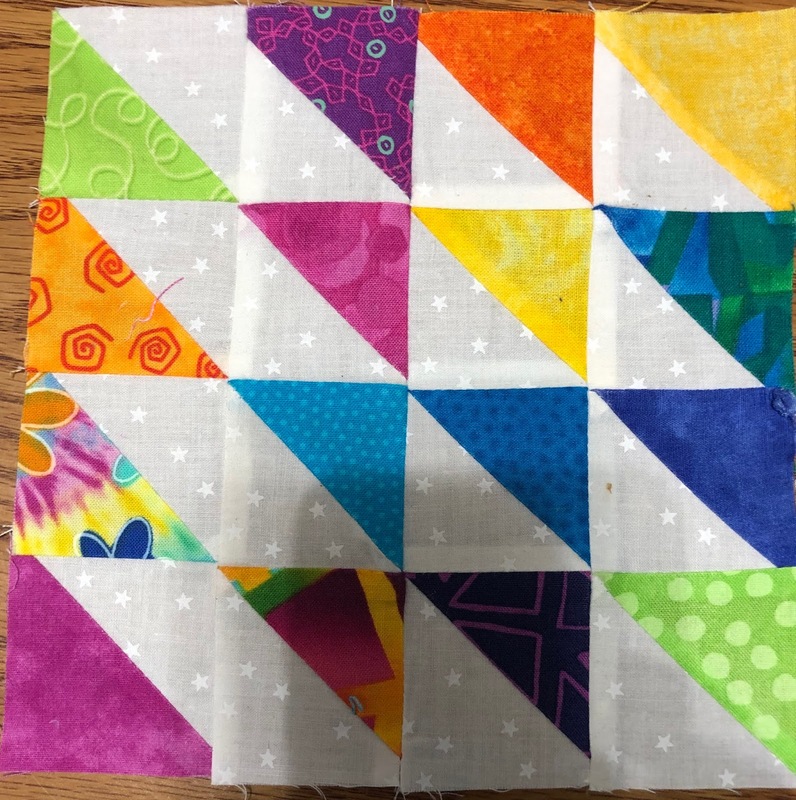 I made a few filler blocks as well. I am changing things up a little on the filler blocks, as I do not want 23 square-in-a-square blocks as I want some variety in them. I ordered backing and borders for the Memory Quilt. 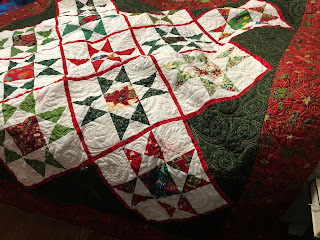 I have the center of the quilt done. 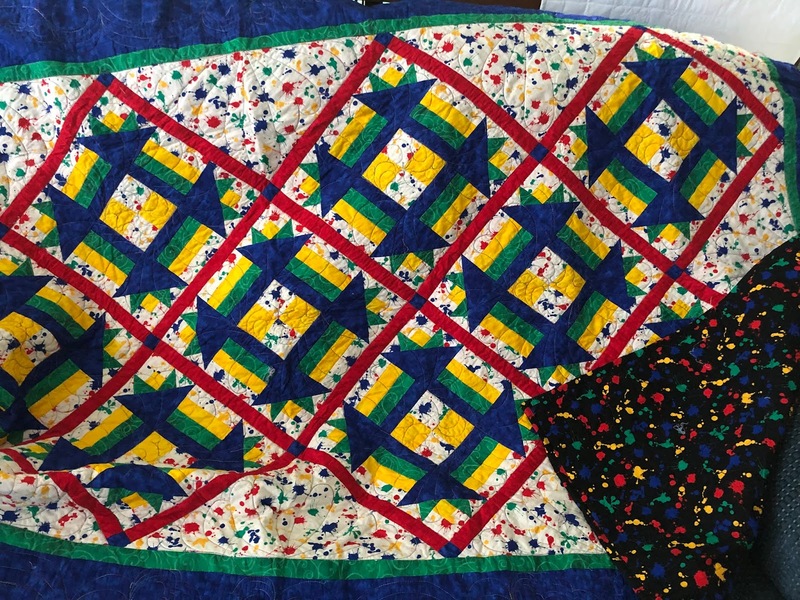 I used pajamas that belonged to a very dear friend's mother. 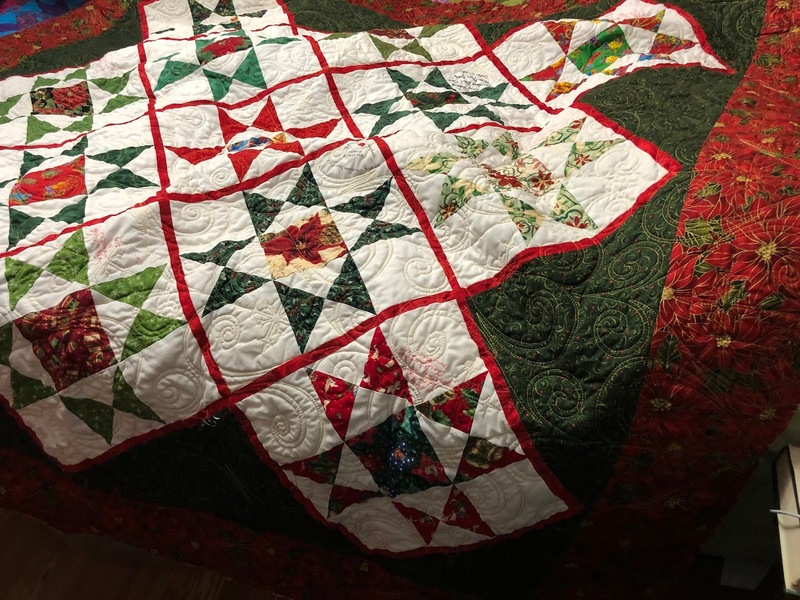 She has not seen the complete center of the quilt yet. 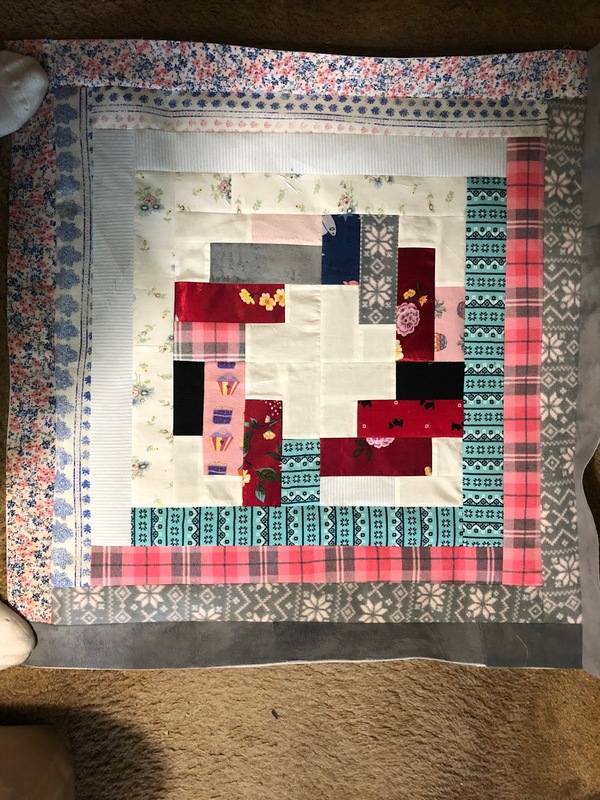 I am debating sending her a picture or wait until I put on the borders or even better wait until I finish it and deliver it to her. I will post a picture of it later, as I don't know if she reads my blog or not. 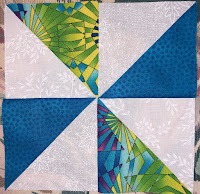 I also ordered a couple of other Jen Kingwell patterns that I would like to try. I have had a nice quilty week. 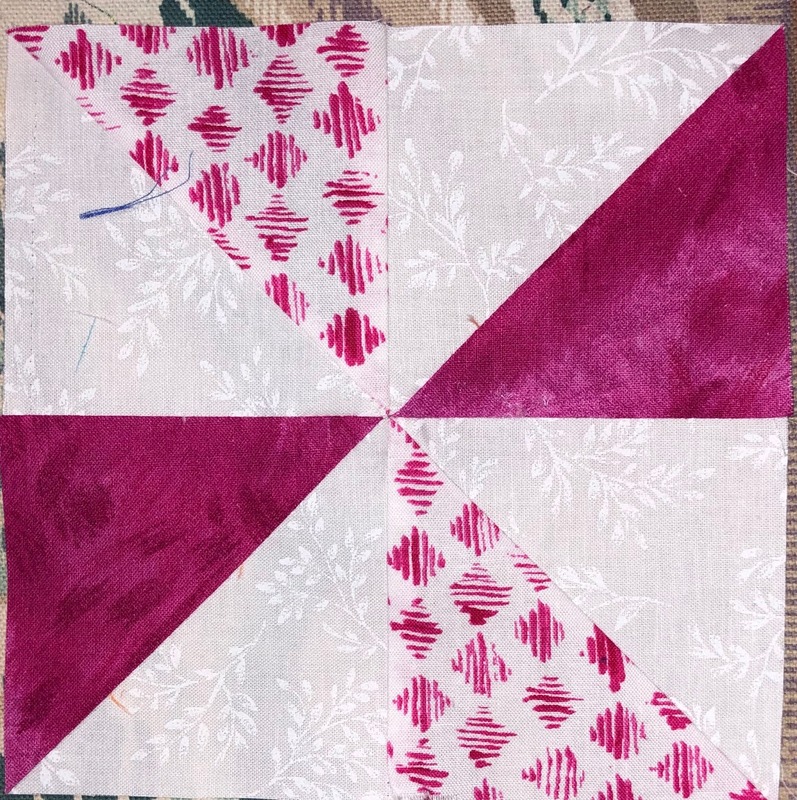 This week I am picking out two quilts that need a binding for the month of March, and planning to work on more blocks for the Gypsy Wife. I apologize for not posting last week but when I woke up on the 11th I was wiped out and felt like I had been run over by a truck. I ached from head to toe and had no energy, just climbing the stairs wiped me out. I had subbed all week doing testing and fighting the crud that was going around the school I was at. It hit me like a ton of bricks on Saturday morning and I was out for the count for about four days. All I did was lay on the couch and veg. I did not have the energy to do more than about 10" of hand stitching on a binding. I spent a lot of time just laying on the couch and doing nothing. Over the last two weeks between subbing every day for the one week, two days the next week, and a day of appointments and errands, and being sick, I did not accomplish much, but I did make some progress. 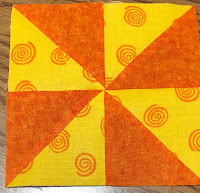 I picked the fabric for eight pinwheel blocks and actually cut out and pieced the 36 HST for the eight blocks. I pieced one heart block and worked on binding Barabara's Attic. 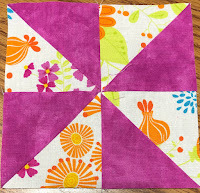 I also cut out six other blocks and pieced a total of eight blocks for the Gypsy Wife quilt. I should add that I am using scraps and small pieces of fabric less than a quarter or a half yard from my stash for this quilt. 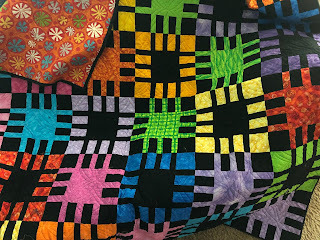 I did buy a couple of quarter yards to add in a little more color, but almost all of the fabric comes from my small pieces scrap box or my fat quarters. 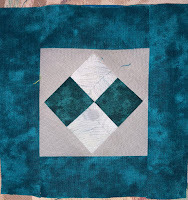 To prove I am using up fabric this picture shows all that I had left after I made the block at the top of this post. This is all that remains of this fabric. 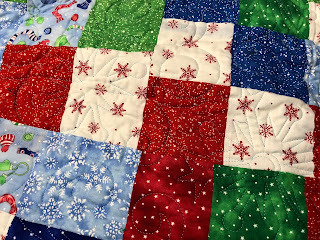 Originally, I had bought a couple yards of it and used it in a couple of quilts in the past. 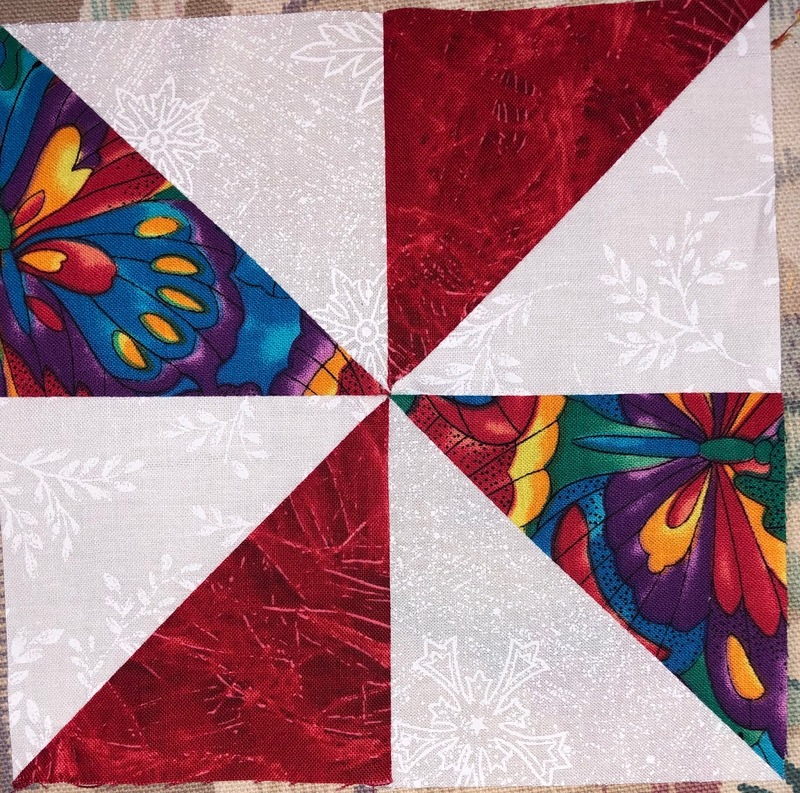 I think I had maybe an 1/8th of a yard when I started on the Gypsy Wife if that. This is all that remains of the fabric. 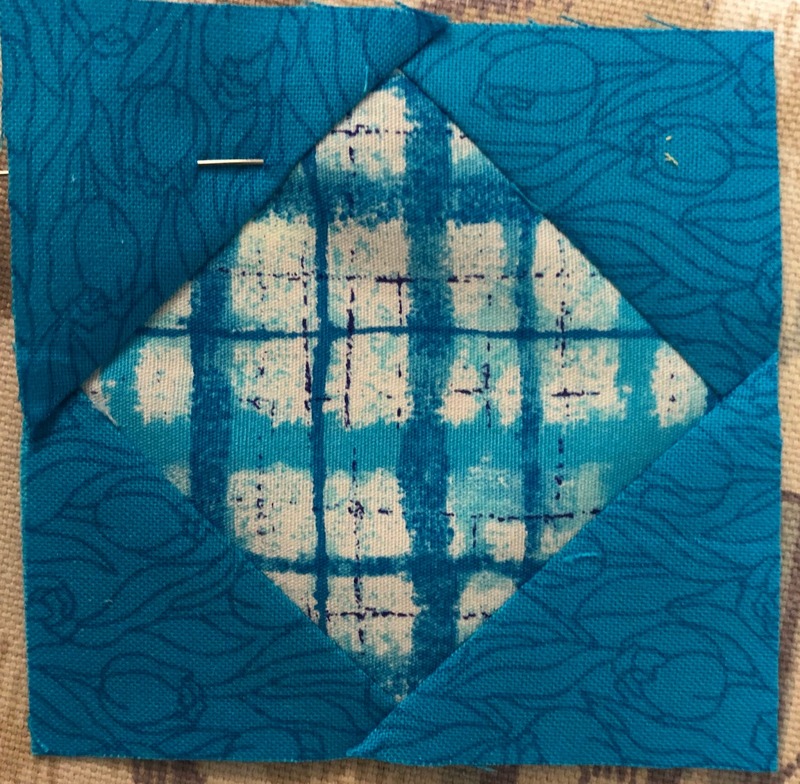 I think I can get a one-inch square out of that larger scrap. 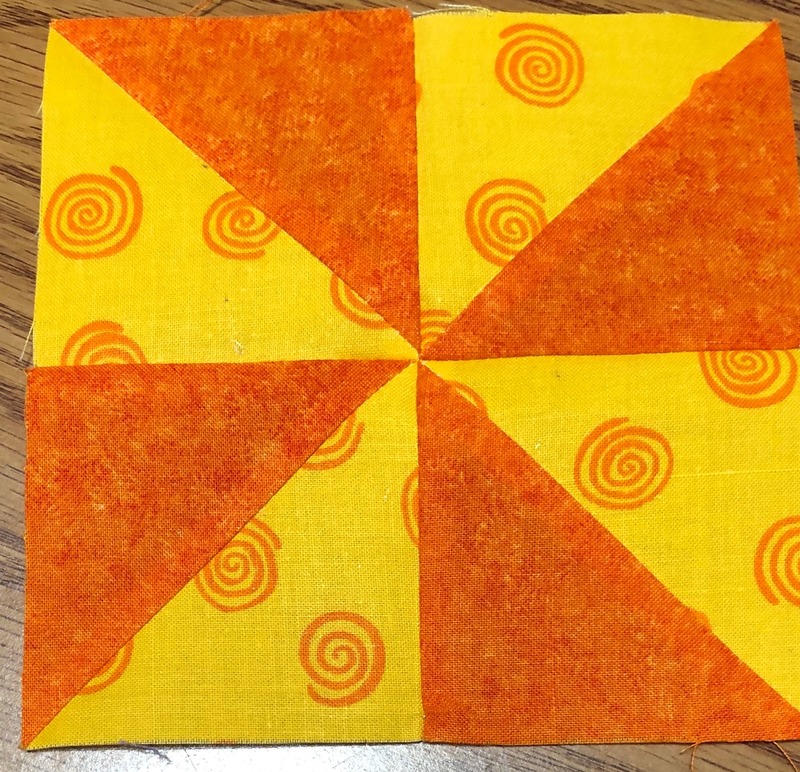 It would work in the center of a block. The other scraps are going in the trash. I trimmed the blocks for the memory quilt. 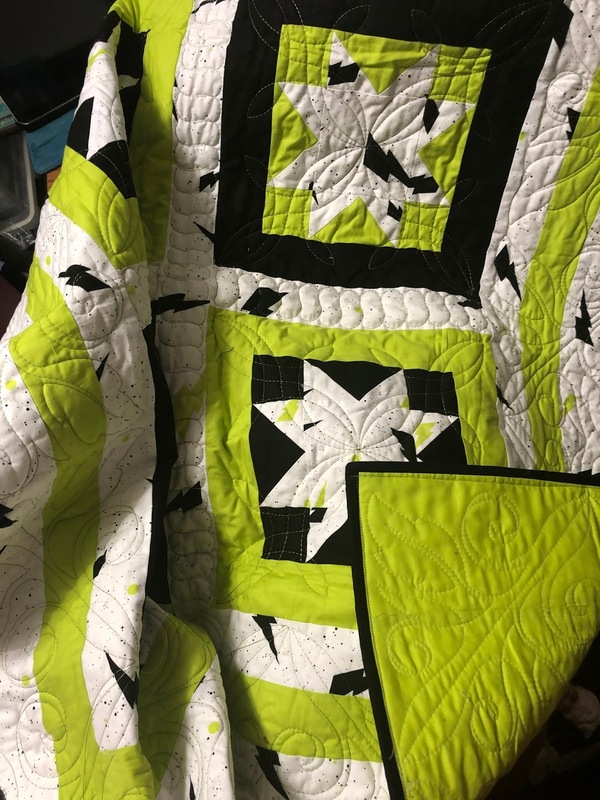 I also had a few quilts come home to roost that are waiting on bindings. 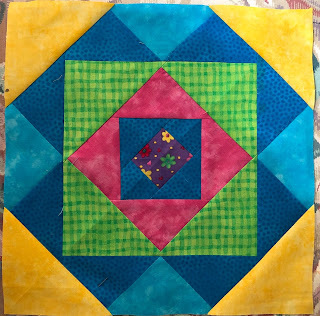 This next week I am not subbing except maybe a half day for one teacher so my plans are to work on putting the memory quilt top together, to finish the binding on Barbara's Antiques so I can have my second finish for February, and to piece some more blocks for the Gypsy Wife. 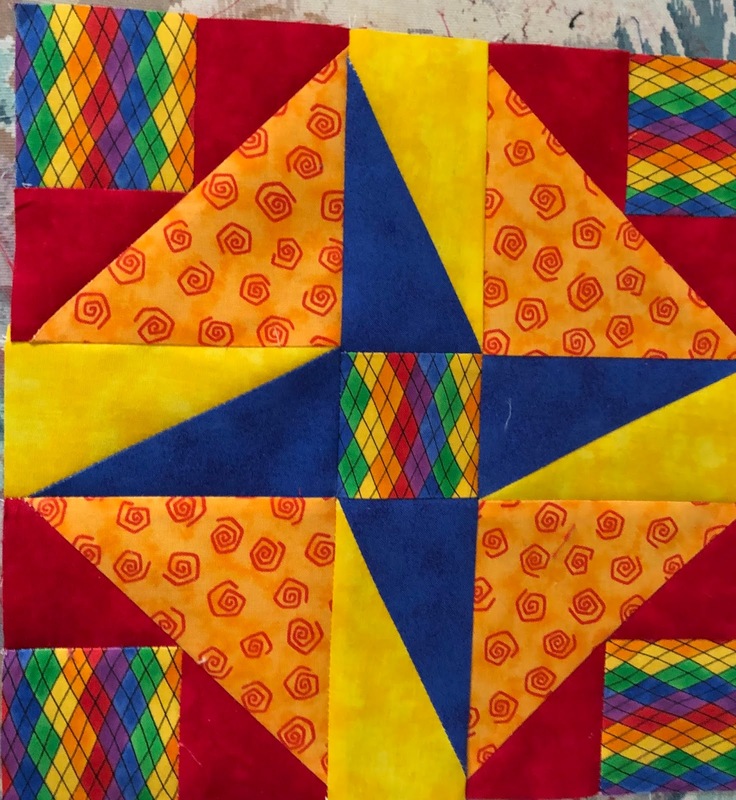 Wishing you all a happy quilting week and good health. 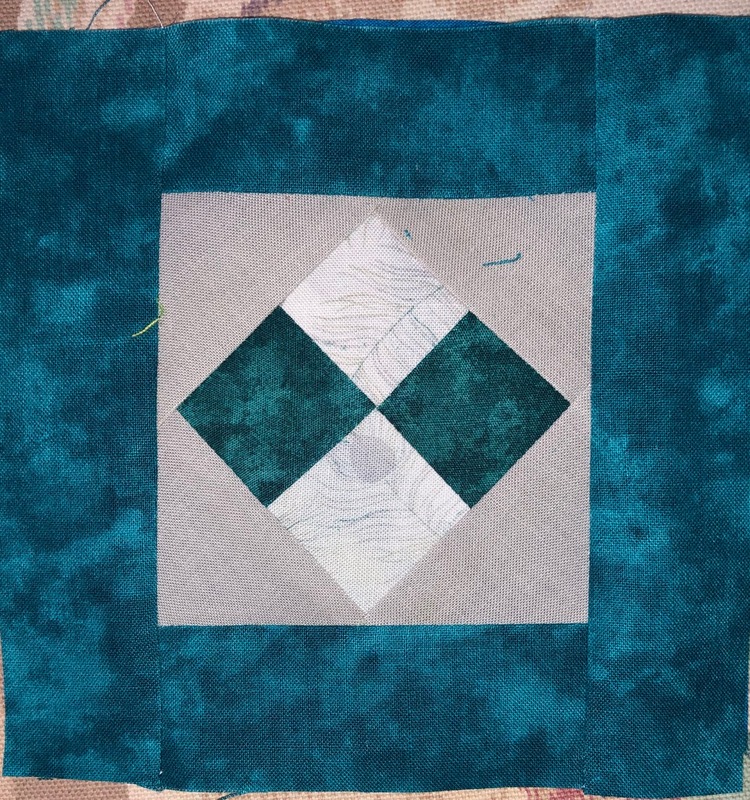 Embroidery Projects in the Works. Surprise for my Cousin, Janie!